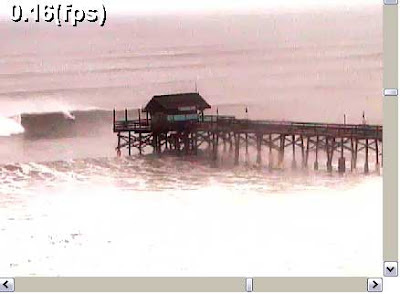 A couple of frame grabs below from the Cocoa Beach Pier cam at high tide, 1 PM today, Sept. 5, 2008. Tropical storm Hanna is about 100 miles due east. Wind is 25 mph out of the WNW and air temp is 77 degrees. No rain at the moment but small showers earlier this morning. The 20 mile buoy is reading 17.7 foot swells with 12 second periods. Surf is bigger south but cleaner at the pier and north into Cape Canaveral. 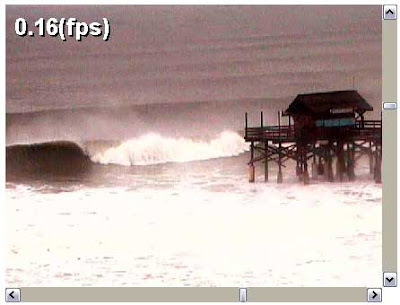 A stoked individual drops in on a big left out in front of the pier. Also the occasional right peels through. No takers for this one. Surfing can only be peripherally explained and described. It is far too complex and much too internalized to approach in any other way.